The capitol building in Springfield, Illinois. 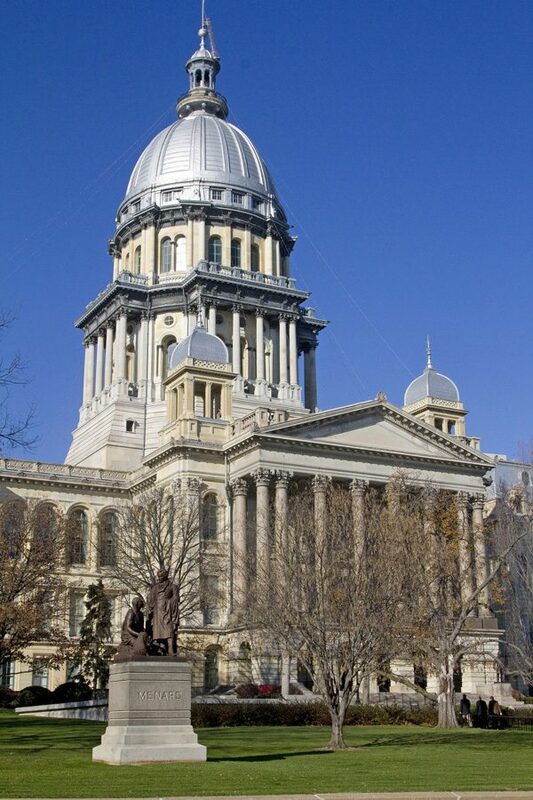 Illinois state representatives will consider several gun control proposals on Wednesday. Illinois state representatives will introduce legislation on several gun control measures on Wednesday, following many constituents’ calls for action to combat gun violence after the school shooting in Parkland, Florida, earlier this month. House Speaker Michael Madigan (D-Chicago) will call votes on a proposal that has been stalled since last year to require gun shops to have licenses from the state, as well as a bill allowing law enforcement or family members to ask a judge to take away a person’s weapons if they believe the person poses an immediate threat, according to an Illinois Senate Democratic Caucus news release. There is also legislation, which was still being written as of Friday, up for consideration that would prevent people under the age of 21 from purchasing military-style assault rifles, according to the Chicago Tribune. The proposal to license gun shops passed the Senate last year, according to the Tribune, but was not called for a vote in the House after opposition argued that the bill would increase the price of guns due to the costs of obtaining a state license. In response, a Senate committee has presented a bill that would limit licensing fees to $1,000 for a five-year period, according to the Tribune. Gov. Bruce Rauner has not commented on the issue, though the Illinois Department of Financial and Professional Regulation — which would oversee the issuing of the licenses — has come out against the proposal, according to the State Journal-Register. Another piece of legislation up for consideration, the Lethal Violence Order of Protection Act, would allow judges to revoke someone’s firearms or Firearm Owners’ Identification card if the person’s access to weapons poses an immediate threat. The bill received initial approval by a Senate panel, including some Republican support. The State Journal-Register reported that Republicans have “hailed” the act as a gun control proposal they could support. Madigan said the public furor from students and families “whose lives have been forever changed” was the reason for the Democrats to push for a vote on these proposals now, the Tribune reported. The vote will follow a high school shooting that left 17 dead in Parkland, Florida on Feb. 14, after which many Illinois politicians called for more concrete action, and the death of a Chicago police officer who was killed while off-duty Feb. 13 . Students and gun control activists have since planned marches and school walkouts to urge politicians to take steps to prevent gun violence. An Evanston contingent will travel to Springfield on Wednesday for an event organized by the Illinois chapter of Moms Demand Action for Gun Sense in America, where Illinois residents will have the opportunity to meet with legislators and advocate for gun reform.